I teach Wood shop, Architectural Design, and Mathematics to high school students in Mill Valley California where I also run an Adult woodworking program through TUHSD Community Education (Marinlearn.com). 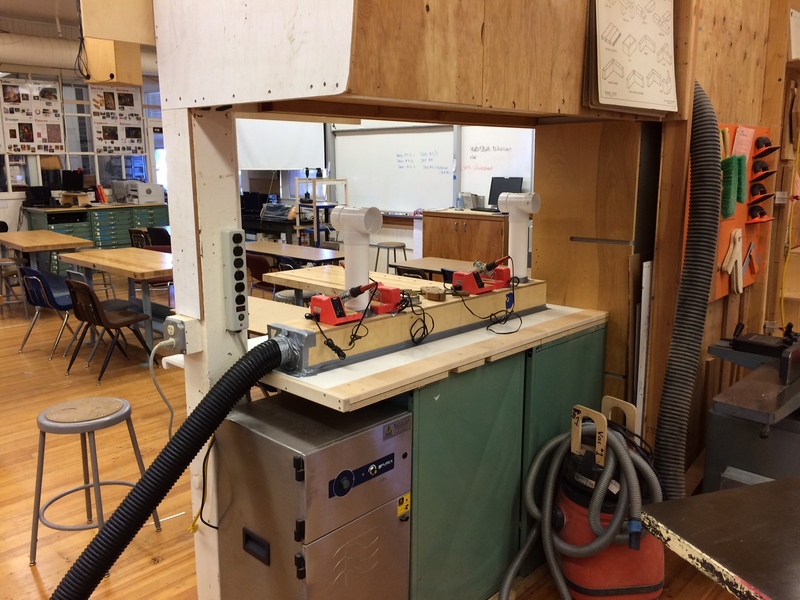 As I have taught students to use the bandsaw, or any tool for that matter, I have found it tricky to get a whole class of 25 or so students to see what I am doing close up. I had made previously made a video demonstrating how to use the wood lathe. And since my maker students are going to now learn to use the band saw, I decided it was time to make a classroom presentation. I decided on a PowerPoint.I spent about 12 hours taking photos and piecing together the PowerPoint. I have since shown it in class to my students and shared this with colleagues in my district and in the Sonoma State professional maker development course. The Autodesk workshop on 123d circuits has been useful. I learned how to use the online application. Additionally I learned of Autodesk’s new environment, Project Ignite. It contains a series of self-paced activities with specific instructions for how to use the 123D applications. There are currently activity series for 123D circuits and for 123D shapes (you can design something and print out on a 3d printer). I implemented the Ignite activity for the circuits by having my students work through an 8 step lesson module. I supplemented it with checkpoints where I had to inspect their work at the computer. I also had them build a couple of the circuits with breadboards, wire and lights. I do wish I had more time to develop the curriculum. I had ideas for them to demonstrate that they could use the multimeter and really understood the circuits. I have been too swamped to carry that out extensively. The other Autodesk workshop was on Fusion 360. 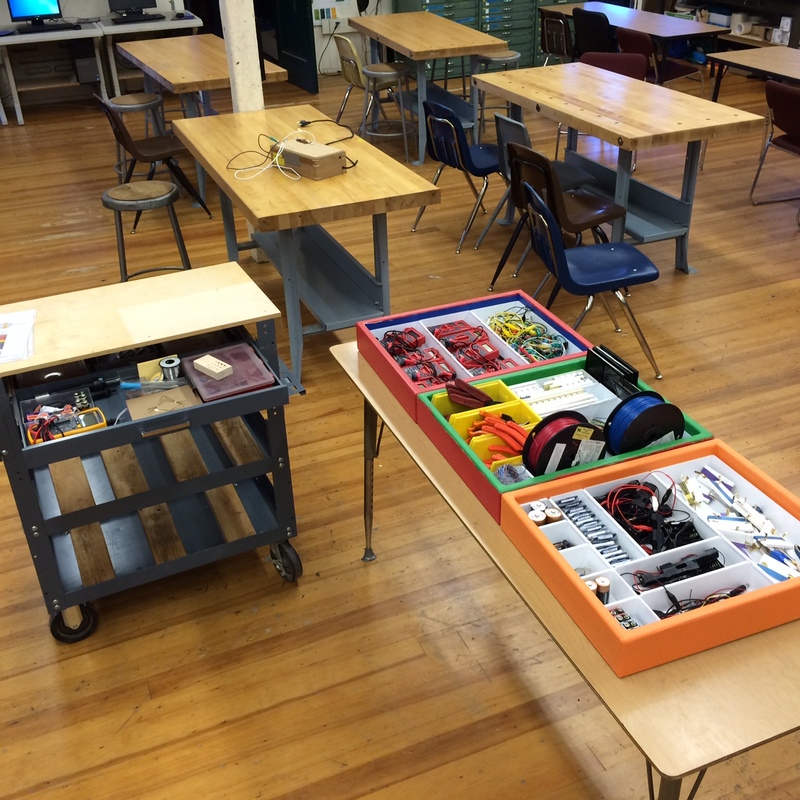 Steve Temple at San Rafael High has switched over to using that from Autodesk Inventor. I can see why. The interface is much more intuitive. Also, it will run on a Mac. Autodesk offers free student licenses for this software but many students have Macs rather than PCs so that has inhibited them from downloading their own copies of Inventor. Now they can get copies of Fusion 360 whether mac or pc. LED Sequins student elective activity. We have a day next week where students sign up for enrichment activities. I offered that can sew an LED sequin and batter onto their cloths. I stocked the materials. Now I just need to practice it myself. I made an extensive power point for explaining the workings of a band saw including use and safety. Showed this to students in class. Then I made a multiple choice and short written response quiz on Moodle so they could test on-line. Haven’t scored the tests yet. Meanwhile I am one by one having them practice and demonstrate the use of the band-saw with me at their side. I have gotten through 6 of 24 students. I have them practice on a mock band saw first so they learn not to twist the blade. Most students get it. A few have not and at least one of them twisted the mock band saw hard enough to bend the blade. I have thought of making a mock band maze where they have to get a pre-cut path pushed along a blade with out touching the edges. That can be an electrical circuit with a buzzer. The edges of the cut will be lined with copper tape so that if the blade touches, it will set off the buzzer. A successful trial will be getting through the whole path without setting off the buzzer. I have a sub today. I left instructions for the students to begin their marble mazes. They will eventually be stacked one above the other so students need to identify the entry and exit points on their maze boards. They then draw their maze out and trace it on tracing paper. They will be gluing their tracing paper cut-outs onto some MDF to cut the maze paths on the bandsaws. This will afford them a low-consequence opportunity to hone their band-saw skills. The electronics unit ended with a whimper. A few students still need to finish the required circuit. I did not have time to make an electronics quiz. 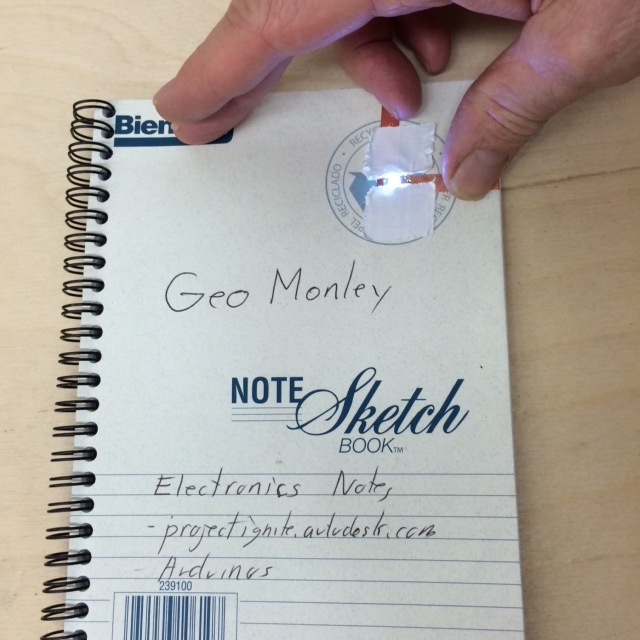 I did have them put up their hacked notebooks with an LED and a hand-made switch. Students will soon take the drill press quiz on-line. They will need to use drills for the Marble Maze activity. I have had them start making spoons by using gouges and mallets on short blocks of Alder. They are taking to it readily. The next step of the spoons will be for them to make cuts on the bandsaw. The main activity that requires the use of the band saw is to make a marble maze. I still need to make a sample marble maze for them to emulate. I am wondering how to set things up so I can get all the students passed to run the band saws. There are several steps and it should take 1 – 2 weeks. We review vocabulary and safety rules as a class. Students practice on a mock-up band-saw to get a feel for how to make the curves. Each student demonstrates that they can do basic adjustments on the Band saw and cut curves on practice stock. There are only three band saws to use and I have 24 students. Having another activity for the other students can be challenging. The ones who learn the band-saw quickly can work on their spoons. For some of them, I could cut out the spoons on the band saw for them and then they will have a lot of work filing and sanding their spoons. Students take a paper quiz. They must get 100%. Once they have demonstrated safe use and passed the quiz, then they have permission to use the band saws. I want to make a quiz course where students will have to take a multi-meter and measure an assortment of resistances, currents and voltages. I also want them to be able to do calculations.This is going to be a formative assessment since I think only a fraction of the student know how. It will give them an idea of what they still need to learn. Then I can give a summative test. Preparation and planning for the coming week. So I spent many hours organizing electronics components into bins designed for student access. I have them on a cart so that I can roll it away. 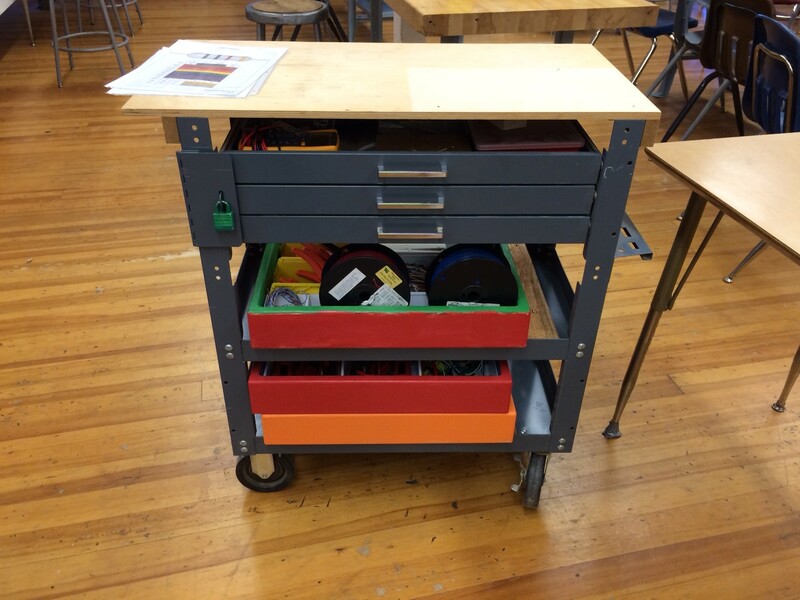 Also on the cart are three locking drawers. In those drawers are the precious things that I want to personally hand to students as they need them. The parts trays off the cart and spread out ready for use. I also set up a soldering area and hooked up a fume extractor that was too small for use with our laser cutter. Here is a neat tidbit: I had made a 5 volt power supply box with alligator clip leads. To prevent students from shorting the supply, I had thin wires across contacts. Of course it was too much fun to short the supply and watch the wires melt. So I found a automatically resetting fuse to complete the circuit. The main activity for tomorrow will be for them to hack their notebooks. I have some small sticky LEDs, a bunch of copper tape, and some 2032 batteries. I will allow them to wire up and keep the setup for any notebook they own. The sticky LEDs are very expensive. Some of my students who already know how to solder, can use a quantity of multi-color LEDs that are very cheap but that need leads connected to them. Here is my notebook hack. Pushing down in a few places makes the lights go on.